For many, the southern part of Northwest China's Xinjiang Uyghur Autonomous Region remains a land of mystery. A majority of the area is covered by China's largest desert, the Taklimakan, which in Uyghur means "the Gobi under the mountain." People in this area, which is 95 percent Uyghur, have to cling to whatever land or resources that the desert has left available. These harsh natural conditions have lead to economic and even social issues. The region is underdeveloped with a high unemployment rate. This situation combined with a lack of quality education has led to a rise in religious extremism over the past few years, which in turn has given birth to terrorism. Graduating from Tsinghua University in 2011, Zhao worked as a government employee in Urumqi, the capital of Xinjiang. 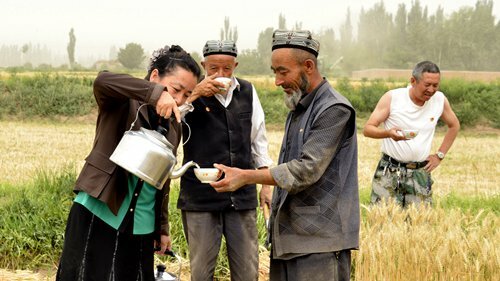 In 2014, in the wake of a slew of terror attacks both in and outside Xinjiang, the regional government decided to send 200,000 officials to rural areas to help reinforce local governments, win over local residents' hearts and uproot extremist ideology. Zhao was among the first group of government employees sent to southern Xinjiang. During the year he spent in a village in Wushi county, Aksu prefecture, Zhao recorded his interactions with local Uyghurs. These writings later became the basis for Notes. His first book, it was released in January. 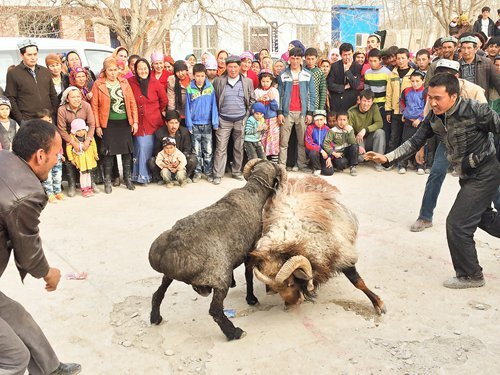 He recorded the village weddings and funerals, the Uyghur festivities during which people gathered and danced, and the basketball games he played with villagers. He recorded local people's customs and traditions as Muslims, telling stories of their joys and sorrows. Despite living in a region that outsiders might consider dangerous, he depicted his fellow Uyghur neighbors as polite, gentle and hospitable. But most importantly, his book showed, from first-hand experience, how government policies are implemented at the grass-roots level in Xinjiang. Of the 200,000 officials that have been rotated in and out of rural Xinjiang over the past three years, Zhao is the only official so far who has recorded his work in Xinjiang in a systematic manner and presented it to the public for scrutiny. The book, which is written in Chinese and comprises 45 essays, not only introduces southern Xinjiang and Uyghur culture to those outside the region, but also provides insights into some of the social woes that have been plaguing Uyghur society, thereby offering a unique perspective for the outside world to understand the Chinese government's policies. "March 15, 2014. Our cook, Riyagul, took a few days off to prepare for her second daughter's wedding. Last night she came to invite us to attend the event, which we will, as attending weddings is part of our job." Zhao described the wedding in one of his essays. After giving a cash gift to the bride, he and his colleagues were taken to a banquet where they enjoyed a five-course meal that started with snacks and candies and ended with lamb pilaf. "No utensils were allowed for the lamb pilaf, so I found it difficult to grasp my rice with my hands," he wrote. After the meal, the Han guests read a prayer along with their Uyghur hosts and then everyone headed to a neighbor's courtyard for Meshrep, a traditional dance. A band hired from a neighboring town played a string instrument called tanbur that is popular in the region. Unlike the Waltz, which traditionally involves a man and a woman, Meshrep can be between two men. During the wedding, a male relative from the bride's side and another male relative from the bridegroom's side led the dance as they held onto a single tree branch with their hands. Apples, candy and fried pancakes hung from the branches and were later distributed to the guests as a sign of goodwill. Although the wedding party was joyous and bustling, it is now rare to see Meshrep performed in rural Xinjiang due to the influence of religious extremism, which bans all forms of music and dance at weddings. Zhao wrote in his essay that his team had to persuade the newlyweds' families to hold a wedding party. An imam was invited to oversee the Meshrep and assure the parents that it would be permitted. One of the villagers told them that even through they had wanted to include the dance originally, they felt restricted by the conservative atmosphere and had been waiting for someone to take the lead in breaking the ice. Similar to how he arranged the Meshrep for the wedding, much of Zhao's work in the village consisted of small matters. He would often visit different villagers and speak with them to see what the local government could do to improve their lives. During this time he also began to learn the Uyghur language and asked villagers to practice with him. In one of his essays, he wrote about how he once drove hours to help a young Uyghur woman catch a train so that she could take part in an education program that had the potential to change her life. However, not everything was a success. Zhao and his team once organized a game of tug-of-war but few villagers showed up. "It's not because they were being unsupportive. Those who live in rural areas are not used to group activities. We need to come up with better ideas to attract villagers," he wrote.